Atlas 370 Palmtech gloves are a favorite with roofers, mechanics, HVAC installers or any worker requiring protection and maximum dexterity. Atlas 370 Nitrile gloves are lightweight, nitrile-coated nylon knit gloves that fit like a second skin, with a seamless nylon liner that increases comfort. These are the best gloves we have ever purchased. They are very comfortable and besides having a gripping surface , the allow picking up of even the tiniest part. They are very durable and can be thrown in the washer for easy cleanup. 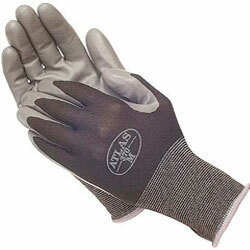 They are the longest lasting gloves of this style that we have ever purchased. An outstanding product. great gloves at a great price. Got these for the cables at half dome. I know they will be grippy enough, and no worries about them wearing out either.